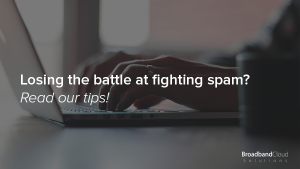 With an increase in spam emails recently, we thought we’d give some tips on fighting spam, once and for all! We’ve got some steps that you can take to tighten things up but it’ll be a bit of a work in progress. This comes as standard with all of our hosting accounts. When you sign up, we send you login details to access your control panel. When you log in, scroll down and click on ‘Apache Spam Assassin’. Once you’ve done that, the first thing you’ll need to do is to enable it. Once enabled, you’ll be able to tweak the options even further in order to fight spam. Next, set your spam score to a value between 1 and 5. Are you receiving spam emails from that same email address? Apache Spam Assassin offers further options to even blacklist emails; meaning goodbye spam and hello legitimate emails! You’re probably wondering how to blacklist email addresses now, aren’t you? It’s really easy! Click ‘Configure Apache Spam Assassin’. Next, you’ll be taken to a page with a number of ‘blacklist fields’. These are going to allow you to block all mail from specific domains or email addresses. To block an address that you frequently get spam from, simply paste it into one of the blacklist fields. Scroll down to the bottom of the page and click ‘Save’ and you’re good to go! Now this one is a bit of a work in progress, as you can only really limit such spam, as and when you receive it. The next way to fight spam is to create filters which will reduce the amount of spam arriving in your inbox. Email filters essentially create rules for mail delivery. All emails incoming must pass through these filters in order to arrive in your inbox. So if you regularly get spam of a similar nature, you can create rules to discard such emails. 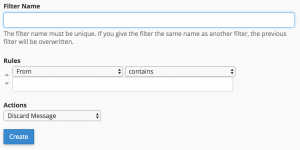 OK, So how do I create a filter? It’s pretty easy! Simply navigate from the cPanel home to ‘Email Filters’. You can create as many filters as you like and start to fine-tune your incoming emails – even fighting spam whilst you sleep! So there you have it! For any questions or queries, do get in touch with us – we’d be more than happy to help. You can email, tweet or phone us.